This Memorial Day 2015 morning, I set out for a walk in our Avondale neighborhood seeking exercise and inspiration. My hour stroll along quiet, empty streets took me north along Milwaukee Avenue north past Diversey Avenue, where I could observe first hand the changes taking place in our little corner of Chicago. 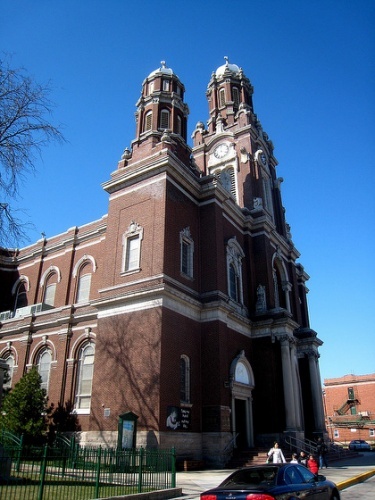 The next time you’re in Avondale, take a moment to visit St. Hyacinth. They don’t make ’em like this anymore. Some old storefronts, once home to mom-and-pop shops, were getting a facelift and new businesses were opening up. Old frame structures on the side streets were replaced by modern homes, adding a new dimension to some blocks. Improvements — or call it gentrification — was happening beyond the Logan Square apex. Then I got to St. Hyacinth Basilica and found the inspiration for this post. There, in a small garden, next to a statue to commemorate Pope John Paul II, was a memorial to men of the then predominantly Polish parish who died and served in World War I. The handsome stone marker was dedicated in 1924, four years after the war ended. There were 499 men from the parish who enlisted and were sent to Europe — the place where they or certainly their ancestors were born — to fight in the “war to end all wars.” Twelve of the men — 11 with Polish surnames and one Italian (I think) — did not make it home. 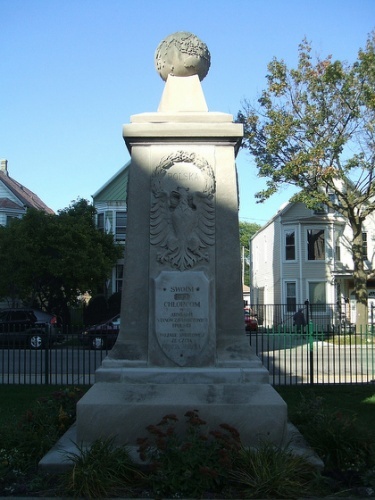 The memorial to men from the parish who served — and died — in World War I commands a prominent place on the parish grounds. I sat in the garden for a while and read the names of the men who died on the battlefield and the inscriptions. Their sacrifice allowed their families to continue to live in America in peace and build lives here. What I realized this Memorial Day is that there probably are thousands of small memorials, like the one at St. Hyacinth’s, to those servicemen and women who died in places far from their homes. What I hope is this: That along with the large, public ceremonies that will take place in America on Memorial Day 2015, that someone visits the smaller places, too. Perhaps you’ll be inspired, just like I was earlier today. Want more Memorial Day inspiration from The PRDude? Please read this 2013 post.